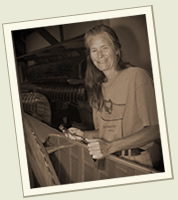 Jeanne Talks about "Why Wood?" Almost everyone interested in a wood canoe at some point asks me "Why wood?" "Why paddle something so beautiful?" "It should be on a wall somewhere." "They're so heavy... they require so much upkeep and work..."
The camp where I learned to travel by canoe uses wood canoes because they believe that by learning to respect and care for one's equipment, we learn to take care of the environment, and we learn to take care of and respect each other. The material, the care required, the natural beauty of a wood canoe all fit into the experience of wilderness travel. A wood canoe is more of a friend (or a pet) than a piece of recreational equipment (most people name their canoes), and the purchase of a wood canoe should be approached the same way. "Am I willing to take the extra care loading and unloading?" "Will I want to get my feet wet?" "Where am I going to store my canoe?" "Will I enjoy the cleaning and sanding and touchups required each fall?" Asked why we use wood/canvas canoes, those of us who have paddled them for years can mostly only shrug and smile. Maybe its love... cupid's arrow... pure foolishness. Maybe its all appearance... maybe its how quiet they are on the water... maybe its how you can forget the mosquitoes as you admire for the 10,000 time the graceful curve of rib and plank disappear into the bow. Or, maybe its the history and memories we see reflected in each dent and scratch - while imagining our children and grandchildren off on some adventure of their own in the same canoe. 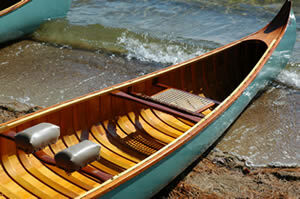 For most people the love for wooden canoes starts the first time they actually get in one and paddle. They are beautiful to look at - but they are much more beautiful on the water - clear skies and Fall leaves, or grey skies and pouring rain, another friend to share it all with.